Tabbouleh, the Middle Eastern dish of fresh herbs and bulghur wheat, is delicious mixed with ribbon-cut courgettes and tangy feta. Preheat the grill to high. In a large bowl, whisk together the olive oil, lemon juice and zest. Pour half the dressing into a small jug. Using a Y-shaped peeler or a small, sharp knife, cut the courgettes into long ribbons and place in the bowl with the dressing. Mix well then arrange on a large baking tray in a single layer. Place under the hot grill, for about 2 minutes each side, until golden and tender. You may need to do this in 2 batches. Meanwhile, place the bulghur wheat in a saucepan and just cover with boiling water. Cook for 10-12 minutes until the bulghur wheat is nearly cooked through and is tender, but still has bite. Drain well and place in a serving bowl. Add the salad onions, cucumber, chopped parsley and mint to the bulghur wheat, then crumble in the feta. Gently stir until mixed together well. Season with plenty of ground black pepper. 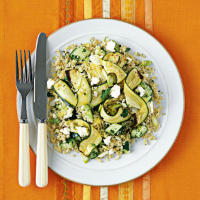 Spoon onto 4 serving plates and top with the courgettes. Drizzle with the remaining dressing and serve. Bulghur wheat is also great as an accompaniment to barbecued meats and fish. Use any leftovers to make a quick lunch, adding diced avocado and a dollop of houmous.